I love quiche. From the first time my mother made it, I've been hooked. There's just something about it...with its creamy custard encased in a flaky crust...studded with salty and savory morsels... It manages to hit most of my favorite taste and texture buttons. 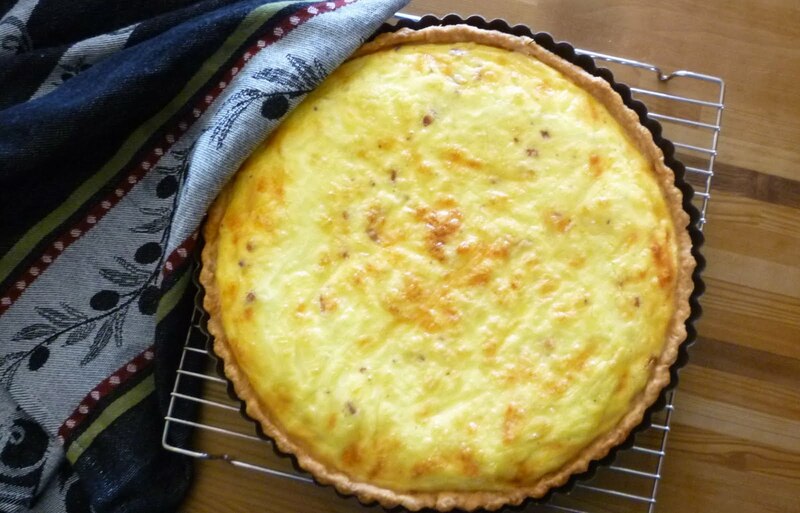 For some reason my mother never varied from Quiche Lorraine...that classic with nothing but egg custard, bacon and, more often than not, cheese. I, on the other hand, have branched way out from this original....adding to the custard fillings varying from just caramelized onions...to asparagus and Gruyère..to kale and ham....and beyond.... Quiche is one of my favorite blank canvases (right up there with pasta and pizza crust) upon which to improvise with the bounty of each season. The variety of possibility is probably why it has been years since I made that original favorite of my childhood. But recently, it came to mind when I was putting together some food to take to a friend. 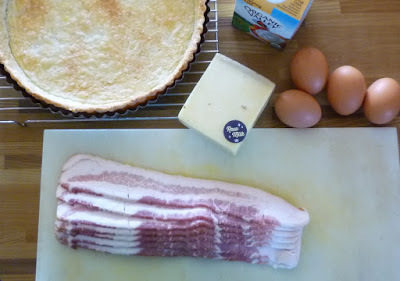 It struck me as just the thing for a "make ahead" weekend breakfast dish: bacon & eggs... bread... Perfect. All I needed to add was a fruit salad....and maybe some muffins or a quick bread (I think you should always have something sweet with your breakfast...). And as I was making it, suddenly I wanted to make another for myself. So I did. We had it for dinner...and then enjoyed the leftovers for lunch. It was even better than I remembered it. The recipe I use is still the same one my mother used. 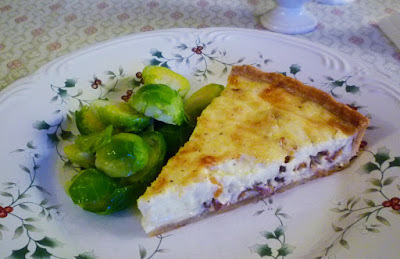 It is from her 1955 copy of The Good Housekeeping Cookbook and is dubbed "Superb Swiss Cheese Pie". 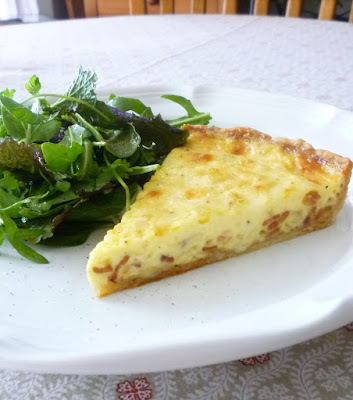 Quiche Lorraine is included as a subheading...but at the time, I imagine Quiche Lorraine was not widely enough known to warrant a stand-alone title. But, title aside, classic Quiche Lorraine it is. It even uses the classic French custard ratio of 2 eggs for every cup of cream. Place the bacon in a heavy sauté pan or skillet and render over medium-low heat until crisp...stirring regularly. Remove to a plate lined with several layers of paper towels using a slotted spoon. Place the eggs in a medium-sized bowl and whisk briefly to break up. Whisk in the cream until smooth. Season with salt, pepper and a pinch of nutmeg; set aside. 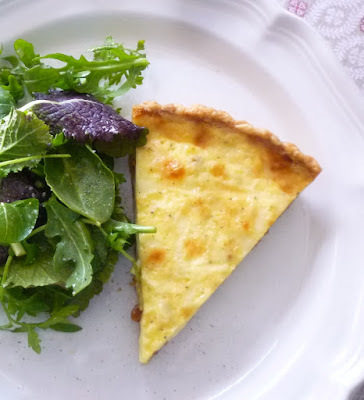 Build the quiche: Place the baked tart shell on a baking sheet and scatter the bacon and cheese over the bottom of the crust. Slowly pour the custard in. Be careful, all of the custard may not be necessary...any that overflows will burn when the quiche bakes. Transfer the baking pan to a preheated 375° oven. Bake the quiche until the filling is set (the tip of a knife slipped into the center should come out clean), slightly puffed and the surface is a light golden color—about 30 to 35 minutes. Serves 8. To blind bake: Line the pastry with aluminum foil (dull side out) or parchment paper, pressing it into the corners and edges. Add a layer of pie weights or dried beans. Bake in a 400° oven for 25 to 30 minutes, pressing down on the weights occasionally with an oven mitt if it begins to puff up. When the pastry colors on the edges and is baked through, remove the foil and weights and continue baking until the pastry turns a golden brown...another 3 to 5 minutes. Let cool before filling.